During the wedding day I took a lot of candid photographs at Château Le Parc. This is one of them. During the mother son dance, the groom expressed his love for his mother by hugging her, kissing her, laughing with her and wiping a tear. 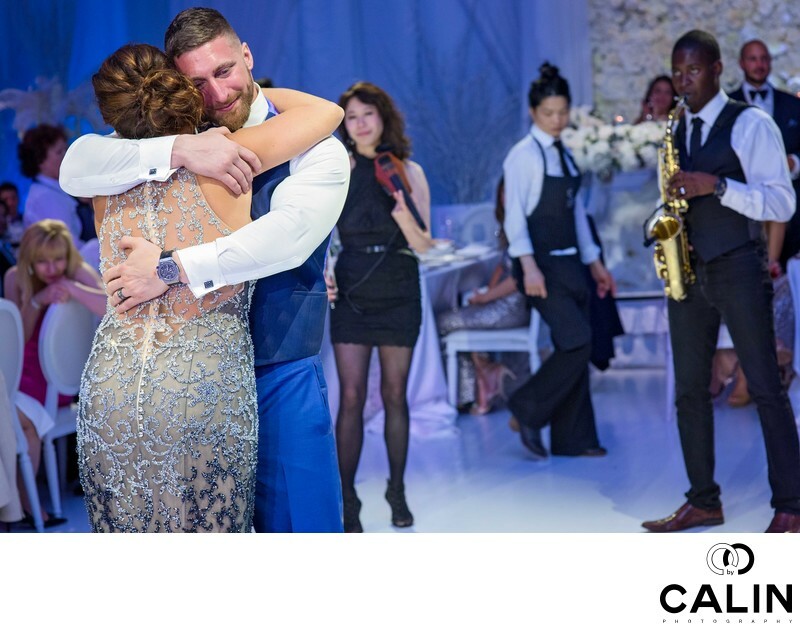 In this particular photograph we can see the groom holding his mother in his arms while the violinist and the saxophone player are looking at them. In the background, we see one of the guests looking at the couple dancing and we can distinguish her smile. Often on the big day the bride and groom don't have enough time to spend with their parents. Between the photo shoot, family photos, the wedding ceremony, of the reception, the speeches and other moments that take place on the special day, the couple has no time to spend with the parents. That's why, the parents dances are often very emotional because the bride and groom get a chance to talk with their parents and it is in those moments when emotions take over. The composition of this photograph is interesting and the couple is placed on the left hand side of the image. On the right, we can see the violinist of the saxophone player and on the left one of the guests. Though the picture is not symmetrical it is very well balanced through the position and visual weight of the various protagonists in the frame. This photograph is one of my favourites I took at this special event and one that the couple cherished enough to include in their wedding album..